One of the USA/Australian-bred members of Shy Ann’s family, Follow The Stars, took out the New Zealand Sapling Stakes today at Ashurton’s flying mile day in a very good 1:53.8. The colt was bought by Mark Purdon at the APG Sales as a yearling. Link to article on the All Stars Stables website which gives the details of the breeding. The connection is via Dateable/Tarport Martha/Adios Betty, one of the strongest branches of the family. Another interest in today’s racing at Ashburton was 5yo mare Highview Aria coming 3rd in her race, and 4yo mare Sara Holley coming 2nd in hers, after doing it tough three wide for much of the way. They are from ITP’s last and second to last crops. Twenty years after his first crop, he’s still got representatives running and doing well today. Remarkable! See my previous blogs about Sara Holley, and some dead but still with us sires. Great racing at Ashburton today – highlights for me were Majestic Time’s win in the 3yo Hambeltonian Trot – didn’t he just fly! – and Ricky May’s drive on Helena Jet, talk about “threading the needle”! 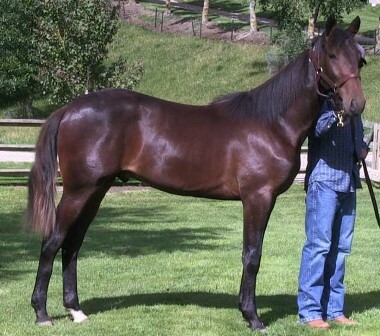 The last in this series looks at Lot 231 at the Premier (Christchurch) yearling sale – a colt by Rock N Roll Heaven out of Highview Diamond, who is a Red River Hanover mare. So that makes the colt, named Rockn Roll Xtra, 3×3 to the great producer Rich N Elegant. There are also double ups to sires – to Western Hanover 3×4, and to Direct Scooter 4x4x5. But I’m focusing on the female double up. I’m not sure the position of Rich N Elegant in the sire’s pedigree is as influential as it may appear expressed as “3×3”. I made the same comment in my Part 2 blog about Roydon Gal. Rock N Roll Heaven’s maternal line is superb, and would have much to do with his success as a racehorse and potentially as a sire. In my view, it places him well to be a sire of good fillies as well as colts. Nevertheless, Rich N Elegant is a class act in any pedigree. 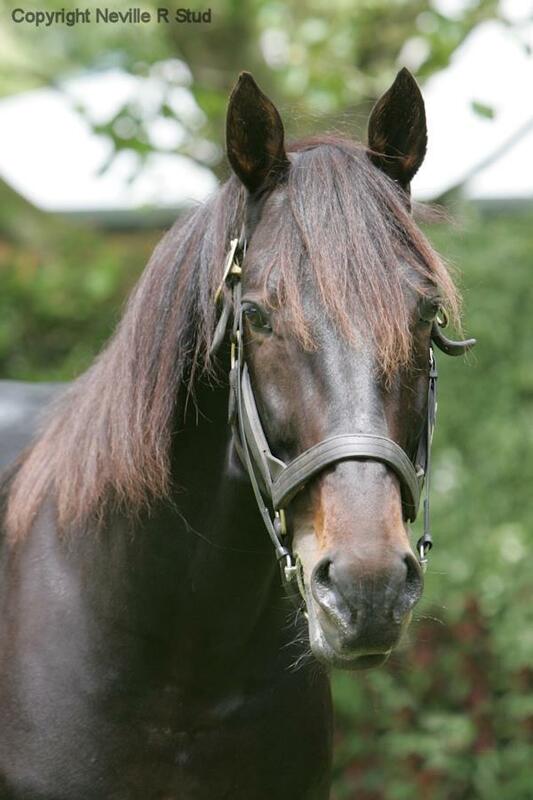 I’ve blogged on Rich N Elegant before so I won’t repeat myself – see my blog of November 2012 when she died, and from there you can link to the 3-part series about her sons at stud. Basically she has left several very, very good racehorses, and the best was definitely Rocknroll Hanover who won over $3 million. He is also the only son to etch out a second career as a highly successful sire both in North America and in Australasia. Her other sons at stud here – Rustler Hanover, Red River Hanover and Righteous Hanover – have left some good horses here and there, but not consistently top racehorses. Still, the quality of the genes they carry from their dam’s strong pedigree and their sires could make them good propositions as damsires. Red River Hanover. Photo: Nevele R Stud. This is very much the case for Lot 231’s damsire Red River Hanover who was a million-dollar racehorse but only a very moderately successful sire. He was a tall good looking stallion, 16.2h, but from what I have heard many of his foals here were a bit ‘fizzy’ or lanky and weak – not suited to run early – and even when given time many of them simply lacked high speed. He was given plenty of chance at stud, having live foal crops of 127, 84, 86, 122 in his first years at Nevele R Stud, but it dropped dramatically after that and he was exported to Australia. He has left some very nice types – Garnett River and Chloe Maguire, both racing in Australia, are examples, and Drop Red won $700,000 plus in North America. A note: Red River Hanover died in Australia of a snake bite just over a week ago. So let’s have a peek at Red River Hanover as a damsire so far in New Zealand. On the ground he has 19 registered foals who are 2yos or 3yos, nothing older. He also has 14 unregistered foals on the database who are not yet yearlings. Some of his daughters have had more than one foal, indicating some level of confidence in the broodmare perhaps: Qualified mare Motu Glitz N Glam has two by Real Desire; qualified mare Tiber Franco has been to Bettor’s Delight twice and to Real Desire; nice two-win mare River Belle has been to Bettor’s Delight twice; unraced Miss Elegance has been to Mach Three, Real Desire and Gotta Go Cullect; David Phillip’s Hambletonian Ltd has put unraced Cathar to American Ideal (died), Art Official, Modern Art and now Tintin In America; unraced Zoe Bromac has been twice to Falcon Seelster. There are some trends there – quite a few searching for speed and going to sires who carry another strain of Direct Scooter. And with Real Desire, the attraction may also be his maternal Golden Miss line, which Rich N Elegant also has. Highview Diamond, however, is the only Red River Hanover mare put to Rock N Roll Heaven so far in New Zealand, to get that 3×3 double up to Rich N Elegant. In Australia, there is also an unnamed yearling filly on the same cross, being by Rock N Roll Heaven from the New Zealand Red River Hanover mare Red River Laine who was exported to Australia in 2008. A quick check shows to date in New Zealand and Australia, mares by Rustler Hanover haven’t been tried on this cross with Rock N Roll Heaven yet, either – but Rustler Hanover’s overall record as a broodmare sire looks quite promising with the likes of Shelbyville and Glenferrie Rustler (both raced in Australia), Franco Nikau and Franco Nadal, and the successful trotter now in Australia (Our) Dolly Would whose breeding is a bit of a surprise for a trotter, being by Artsplace from a Rustler Hanover mare Dixie Darlin (who is from the same family as Courage Under Fire). Sorry just an odd aside! Rich N Elegant’s third son at stud here, Righteous Hanover, had very few foals and only one so far has been tried as a broodmare, the 7 win Samarias Bromac who has a weanling by Falcon Seelster. There are a few more in Australia, but none using the cross to Rich N Elegant. Another siring son Richess Hanover never stood ‘down under’ as far as I am aware. The fourth son is the top sire Rocknroll Hanover, but of course as the sire of Rock N Roll Heaven his mares would be out of the question for that cross. However there is a 2013 colt foal in Australia who is by Rocknroll Hanover from a Red River Hanover mare (Nolarama) which would make it inbred 2×3 to Rich N Elegant, so I guess you never know what breeders might try! Of course it is very early days for Rock N Roll Heaven as a sire, and more foals 3×3 to Rich Elegant may turn up in future. Looking at Lot 231 overall, it’s a family that has had some strength back a bit with the Venetian Star/Star Rhapsody branch, but other branches have not kicked on. His dam Highview Diamond is being given every chance to reverse those fortunes. The result of her first mating is a 3yo filly by American Ideal who looked okay at workouts late last year and has had only one race start to date – her name is Highview Idol. Lot 231 is her next foal, and the Strongs forked out the service fee for a top quality sire and one who throws that interesting double up to Rich N Elegant into the mix. You can see the colt on PGG Wrightsons Sale of the Stars website – video for Lot 231. He looks a good enough type and it will be interesting to view him in person when I’m down in Christchurch. Certainly, Rich N Elegant is a very classy mare to have twice in your pedigree! The article I wrote about the influence of the Shy Ann family is now online. Just click on the Articles tab at the top of my blog. This article was originally published in Breeding Matters, and thanks to them for approval to reprint on my blog. I cover some of the historical and present day connections in New Zealand, and to a lesser extent in Australia (readers: please add comments to flesh this out). Photos from Rod Croon and Highfields Bloodstock show some of the older representatives of the family that are still alive (and in some cases breeding) in New Zealand. Arndon, son of Roydon Gal and sire of the great Sundon. Roydon Gal is the next double up I want to look at in this series of 3 blogs about lots at the NZ Yearling Sales 2014. Lot 45 at the Premier Sale in Christchurch is a colt by Sundon (Arndon x Sungait Song) from a Sierra Kosmos mare Sierra Action. In pedigree terms this makes that colt 3×3 to the Super Bowl mare Roydon Gal. 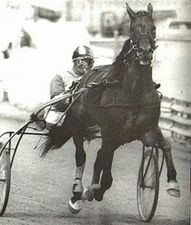 She is the dam of Arndon (world champion trotter). Roydon Gal is also the grandam of Sierra Action on the maternal bottom line of Lot 45. It’s line breeding to Roydon Gal that Roydon Lodge has tried many times before – there are several examples in branches of the family where a daughter/grand-daughter of Roydon Gal has been bred back to Sundon to get “the best of the family blood”. The results have been mixed and not with a lot of luck in the foaling department. By far the best results of this breeding to Sundon are Aspiring Gal and Aspiring Son from Roydon Gal’s daughter Aspiring Lass, which makes them both 3×2 to Roydon Girl (and I’ll get to them shortly). The other success was the very good Sunny Action (65 starts, 13 wins, 5 seconds, 8 thirds, Lt $180,173 ) who is from Roydon Gal’s daughter All Action Gal and therefore also 2×3 to Roydon Gal, but the best she has left since becoming a broodmare is My Mum Beat Lyall who can certainly go alright when she’s in the mood but is not a standout. Other foals from All Action Gal by Sundon have also done well – All Action Son, Solar Active and All Sundon. In the immediate family of Lot 45, his dam Sierra Action has been bred exclusively to Sundon and the end results are really still to unfold. As the advertising says, two of her foals have raced as 2yos including Rocky Mountain Son who sadly died earlier this year, and there is a 2yo filly called Sunset Peak….and then Lot 45 Alpine Sun of course. This branch of the Roydon Gal family (from All Action Gal) is still young and forming, and certainly has potential to throw up top trotters. A yearling from All Sunny, a Sundon daughter of All Action Gal, is also in the yearling sale, Lot 125 at the Premier Sale in Christchurch, for Classic Equine NZ. She’s been bred to the Victory Dream sire Raffaello Ambrosio. Arndon is Raffaello Ambrosio’s damsire, which makes Roydon Gal 4x4x3 to this yearling colt. 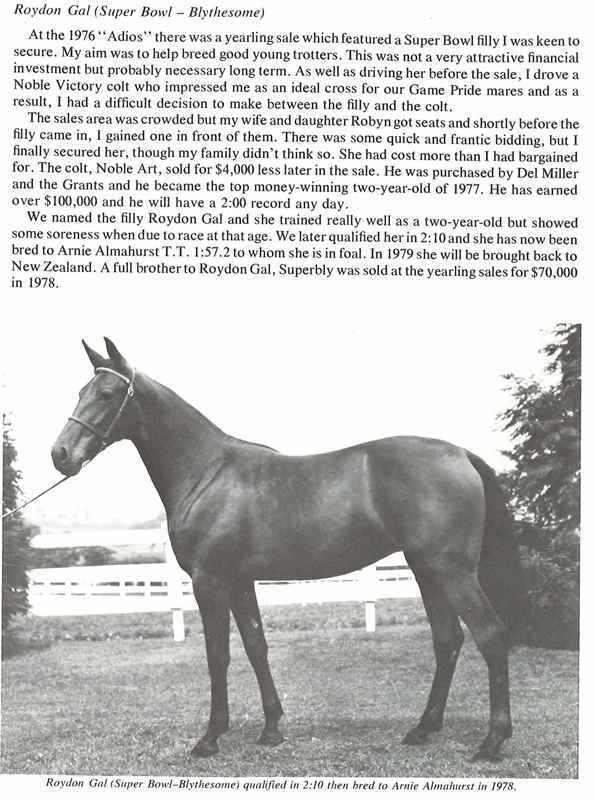 A really in-depth look at the Roydon Gal family is well displayed in the pedigree of All Sunny who is a broodmare at Classic Equine – www.classicequine.net is their website. The most successful branch of the Roydon Gal family is her good daughter Aspiring Lass (by Prakas) who won 8 races here and another 4 in USA for a total of over $100,000. She was a disaster at producing foals, but among the few live ones she did have were the successful Aspiring Son and then later Aspiring Gal – both by Sundon, so the breeding makes them 3×3 to Roydon Gal, just like Lot 45. Aspiring Gal is the gem of the family. She is the dam of very talented Royal Aspirations (28 starts, 14 wins, 3 seconds, 3 thirds, Lt $256,149 to date – and he’s only a 4yo) by Monarchy, Jinja Gal (54 starts, 6 wins, 4 seconds, 4 thirds, Lt $107,696) by SJ’s Photo, and Triumphant Monarch (T1:59.7 $131,893) as well as several younger foals coming on – a 3yo colt by Majestic Son is showing up at the trials, and a 2yo filly by Monarchy likewise. I am a huge admirer of Royal Aspirations – he has kept stepping up and I have seen personally the commitment Fred Fletcher has to letting this lovely trotter develop. Jinja Gal tragically died last year before she had any foals. Aspiring Gal has a yearling Lot 141 at the Premier Sale in Christchurch, a filly by The Pres (Andover Hall x Southwind Allaire). Given the strength of this branch, you would imagine a nice type of filly will be getting a very good price! Going back to Roydon Gal, of course the question has to be asked: how strong is her own contribution in the scheme of things? It lies definitely in the massively fast if erratic Arndon, who later sired Pine Chip as well as Sundon, and also in the lines of two daughters: Aspiring Lass and All Action Gal. There has been enough respect for the family that two others have stood at stud – Roydon Boy and Simon Roydon, but the two great horses Arndon and his son Sundon are where Roydon Gal’s name really shines in siring pedigrees. And for me, this is the interesting point. I am not convinced that where Roydon Gal sits in Sundon’s pedigree is especially influential as part of a double up, being on the siring line rather than through a maternal line. That’s just how I see things. Arndon was a precociously fast 2yo and 3yo, as was his son Sundon, and Arndon’s own sire Arnie Almahurst was a tough, fast 2yo and 3yo champion. High speed is not a trait I see coming through the maternal family or specifically through Roydon Gal. (See here for an interesting 1998 article on Pine Chip that touches on this). Whatever the reason, the faith in line breeding back to Roydon Gal has been rewarded now and then, particularly in the strongest female lines I’ve mentioned and with some top quality racehorses. The Super Bowl mare, Roydon Gal is Arndon’s dam and she followed him with two more [American bred] stakes trotters, Roydon Boy 4, 1.57.3 (by Arnie Almahurst) and Aspiring Lass 3, T1.58.2 (by Prakas). She also has a daughter named Roydon Lass, a full sister to Arndon, who has produced Roydon Lad 4, 1.56f (by Bonefish). Roydon Gal is a half sister to the stakes winner Rising Wind 4, T2.00.1 ($218,332) and is from the Miss Bertha C. maternal family. This is not one of the stronger branches; Arndon is the only major star. (for those who don’t know the history of Roydon Lodge and the contribution of Sir Roy and his father Sir John McKenzie, I recommend the article in the Addington Raceway timeline). Extract from page 111 of The Roydon Hertiage, and photo of Roydon Gal carrying the great Arndon in 1978. There are 3 lots I want to look at because of a double up to quality females, all at the Premier sale in Christchurch – Lot 39, 45 and 231, and the double ups concerned are, respectively, Three Diamonds, Roydon Gal and Rich N Elegant. I’m going to start with Lot 39 is a lovely long barrelled type of colt called Six Diamonds, which immediately acknowledges the 3×3 to Three Diamonds in his pedigree. He’s from a Life Sign mare (Three Diamonds was Life Sign’s dam) and is by American Ideal whose dam is from a daughter of Three Diamonds (Matt’s Scooter x Three Diamonds). check out his video on the Tuapeka Lodge website. This cross has occurred before in New Zealand, including a current 3yo filly and 2yo colt from the nice mare Imprint, who is the dam of the good filly (Am)Opulent now in Australia. Neither have shown up yet but will be interested to keep an eye on them. Another is Delia, who I noted at the 2012 New Zealand yearling sale at Karaka, in a blog: Three Diamonds and a ton of Adios – and did a tip o’ the hat to Three Diamonds who was a very classy racehorse and broodmare. I also looked at the success of that cross in America, but I haven’t updated those statistics yet. However I have updated news about Delia – she is being trained by John Hay and is due to get to the workouts any day now. He says earlier she was a bit weak, but now she’s working better and bowls around okay, and it will be just a matter of seeing how she steps up. There are a few other unregistered young foals on this cross, and one unregistered 2yo to date, but wouldn’t be surprised to see a few more in future. You wouldn’t expect early precocious speed – it isn’t coming from American Ideal regularly although he leaves lovely athletic types and very good 3yos, and nor did precocious speed come often from Life Sign, at least not when crossed with our New Zealand mares. But for those who are willing to let horses grow into their frame and strengthen up, the double up of Three Diamonds via Life Sign and American Ideal is a very attractive option.